Cleanse and invigorate with Ecooking Hand Soap, a mild and gentle hand wash to leave skin feeling pure and fresh. Cleansing and nourishing the hands without drying out skin, the delicate hand soap effectively eliminates impurities while bestowing skin with the subtle fragrance of Orange, Lavender and Rose. Wash your hands and rinse thoroughly with running water. 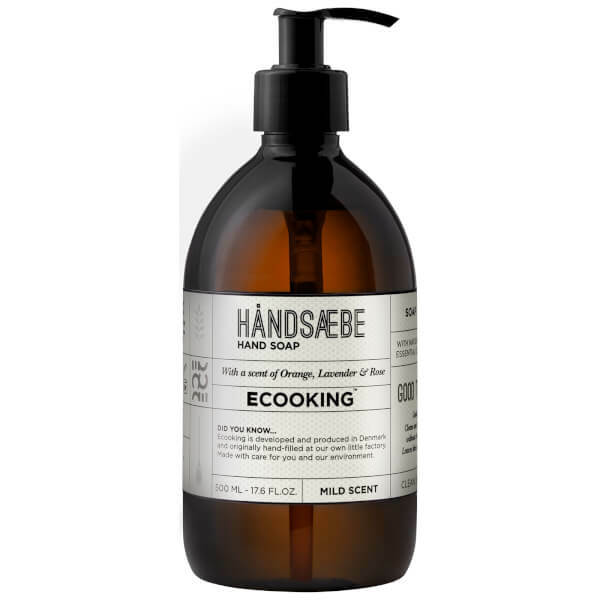 We recommend that you apply Ecooking Hand Cream afterwards in order to reach optimal moisture and care to your hands. Aqua**, Sodium Laureth Sulfate, Cocamidopropyl Betaine, C12-15 Pareth-12, Phenoxyethanol, PEG-90 Glyceryl Isostearate, Glycerin, Sodium Chloride, Sodium PCA, Parfum**, Laureth-2, Octane-1, 2-diole, Citric Acid, Geraniol**, Citronellol**, Limonen/d-Limonen**, Linalool**.